New Glossybox promo code 50% off + two free beauty gifts. Hurry until stocks last! Announcing the Love Goodly summer promotion gift with purchase of the June/July box! Each month, Book of the Month offers members 5 amazing book selections to choose from. But how does one decide? This month, BOTM has created a fun infographic to help members make their March selection. 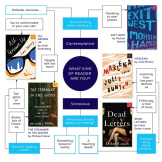 What Book of the Month March Selection Should You Choose? The August Book of the Month selections are here! Allison Williams, one of the stars from the HBO comedy-drama series Girls, is the featured Guest Judge this month. Plus coupons! You can now get 15% off ANY Green Kid Crafts subscription. This equals over $30 off an annual subscription. This is a great time for current subscribers to renew for a year and for new subscribers to sign up for a longer term subscription!